Anderson's Maple Syrup will once again be sponsoring a couple of local drivers in 2012 at the Cedar Lake Speedway in New Richmond, WI. Jason Gross will be driving the #12 GR Motorsports car in the Modified series at the track, and Jason Haugerud will once again be driving the #22 in the Midwest Modified series. 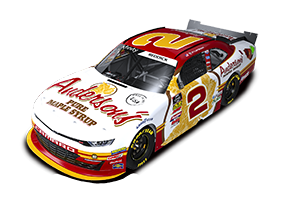 Anderson's is proud to sponsor these two local drivers and wish them well this season. Click here for highlights of Jason Gross's 2012 season. April 6 - It was a night of firsts at the Cedar Lake Speedway, as the track kicked off its 54th season of racing on a clear and somewhat cool early spring evening. Records were set for the earliest start to a racing season ever in the history of the track. In the 24 car Midwest Modified 20 lap feature, driver Jason Haugerud finished 6th. In the 18 car Modified 20 lap feature, driver Jason Gross had some problems and ended up bringing the car home 9th. April 7 - With afternoon rain showers giving way to clearing skies and a brisk wind, the Cedar Lake Speedway was able to complete the final night of their double-header opening weekend racing. In the 24 car Modified feature, Jason Gross grabbed the early lead and led the first 6 laps of the race. After 4 different cautions throughout the race, Jason held on to finish 2nd. April 14 - As the skies turned overcast following what had been a beautiful spring day and with rain in the forecast for the evening, the Cedar Lake Speedway was able to stay perfect in the month of April for their third night of the 2012 racing season. In what turned out to be an incredible 20 lap feature race with a thrilling finish, the NASCAR Modifieds entertained the crowd with some great racing up near the front of the pack. Jason Gross ran a strong race and wound up bringing the car home in 3rd place. June 2 - After a great hot lap session, Jason's car had some rear end problems, requiring him to start 20th in the feature. He drove his way up to 7th and was battling with the 5th and 6th place guys at the end. June 9 - In preparation for the upcoming USMTS races, Jason and his crew were experimenting with a bigger motor and different tires, which caused some problems in the early heat races. The team recovered to salvage a 4th place finish in the feature. In the feature race for the Midwest Modifieds, Jason Haugerud finished 7th. June 23 - A great summer evening resulted in an excellent night of racing at the Cedar Lake Speedway. In the Modified class, Jason Gross finished 3rd in his heat race, and wound up finishing 5th in the feature. In the Midwest Modified class, Jason Haugerud finished 6th in his heat race, and wound up finishing 9th in the feature. July 6 - In the 28 car Midwest Modified feature, Jason Haugerud was running strong and slowly picking cars off when trouble in the rear of the car (torque converter) took him out of the race and gave him his first DNF of the year. July 14 - The NASCAR Modifieds were back on the weekly program after having a night off, and their 20 lap feature event proved to be a great race. The 20 car starting grid was paced by Adam Hensel and Zack Drews, but Rick Kobs ended up being the race winner, with Jason Gross coming in 9th. August 2nd - A warm, muggy summer evening made for a great opening night crowd at the Cedar Lake Speedway to kick off the three-day 25th Annual USA Nationals. With 57 late models signed in to do battle in the Corn Belt Clash Series portion of the program, a strong field of 25 NASCAR Midwest Modifieds were on hand as the support division. Although it was a non-points race for the Midwest Mods, a decent number of weekly competitors and some occasional visitors were on hand gunning for the $400-to-win feature payout. Jason Haugerud had a strong run, eventually coming in 5th in the feature. August 11th - After finishing 5th in his heat race, Jason got a good draw and started the Modified feature in the 4th position. A couple cautions kept the field close, allowing Jason to battle for the lead toward the end of the race. 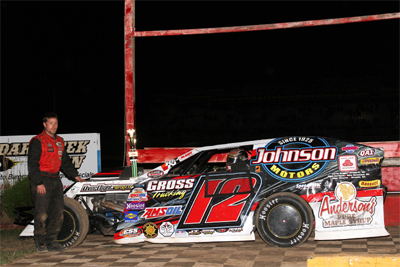 On the last lap, Jason finally made the pass on the inside stick, giving him his first win at Cedar Lake in 2012. August 18th - Driving in place of Jason Haugerud, the car of Mike Gibson caught on fire at the halfway point of the race. Gibson was okay, but the car was out of action for the rest of the race. Jason Gross ended the 2012 season 2nd in points in the Modified series, while Jason Haugerud finished up 12th in the Midwest Modified series. On weekends when there's no racing at the Cedar Lake Speedway, the GR Motorsports team will usually head over to the Rice Lake Speedway to race. Click here for more information about these races. The 2012 dirt track season officially started back in February when the GR Motorsports crew once again headed to Florida for the UNOH Dirt Car Nationals. Click here for more information about these races. In addition to running a full season at Cedar Lake, GR Motorsports driver Jason Gross will also be competing in select USMTS events in 2012. Click here for more information about these races. ® RCR Enterprises, LLC - © 2018 Anderson's Maple Syrup, Inc. All rights reserved.